In 2003, when he won the American League home run title and the AL Most Valuable Player award as a shortstop for the Texas Rangers, Alex Rodriguez tested positive for two anabolic steroids, four sources have independently told Sports Illustrated. Rodriguez's name appears on a list of 104 players who tested positive for performance-enhancing drugs in Major League Baseball's '03 survey testing, SI's sources say. As part of a joint agreement with the MLB Players Association, the testing was conducted to determine if it was necessary to impose mandatory random drug testing across the major leagues in 2004. When approached by an SI reporter on Thursday at a gym in Miami, Rodriguez declined to discuss his 2003 test results. "You'll have to talk to the union," said Rodriguez, the Yankees' third baseman since his trade to New York in February 2004. When asked if there was an explanation for his positive test, he said, "I'm not saying anything." The MLBPA issued a statement on Saturday, saying "Information and documents relating to the results of the 2003 MLB testing program are both confidential and under seal by court orders. We are prohibited from confirming or denying any allegation about the test results of any particular player[s] by the collective bargaining agreement and by court orders. Anyone with knowledge of such documents who discloses their contents may be in violation of those court orders." Though MLB's drug policy has expressly prohibited the use of steroids without a valid prescription since 1991, there were no penalties for a positive test in 2003. The results of that year's survey testing of 1,198 players were meant to be anonymous under the agreement between the commissioner's office and the players association. Rodriguez's testing information was found, however, after federal agents, armed with search warrants, seized the '03 test results from Comprehensive Drug Testing, Inc., of Long Beach, Calif., one of two labs used by MLB in connection with that year's survey testing. The seizure took place in April 2004 as part of the government's investigation into 10 major league players linked to the BALCO scandal -- though Rodriguez himself has never been connected to BALCO. The list of the 104 players whose urine samples tested positive is under seal in California. However, two sources familiar with the evidence that the government has gathered in its investigation of steroid use in baseball and two other sources with knowledge of the testing results have told Sports Illustrated that Rodriguez is one of the 104 players identified as having tested positive, in his case for testosterone and an anabolic steroid known by the brand name Primobolan. All four sources spoke on the condition of anonymity due to the sensitive nature of the evidence. 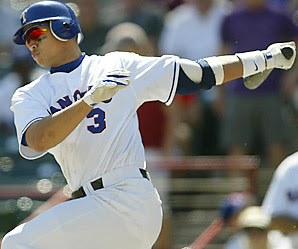 Rodriguez finished the 2003 season by winning his third straight league home run title (with 47) and the first of his three MVP awards. Because more than 5% of big leaguers had tested positive in 2003, baseball instituted a mandatory random-testing program, with penalties, in '04. According to the 2007 Mitchell Report on steroid use in baseball, in September 2004, Gene Orza, the chief operating officer of the players' union, violated an agreement with MLB by tipping off a player (not named in the report) about an upcoming, supposedly unannounced drug test. Three major league players who spoke to SI said that Rodriguez was also tipped by Orza in early September 2004 that he would be tested later that month. Rodriguez declined to respond on Thursday when asked about the warning Orza provided him. When Orza was asked on Friday in the union's New York City office about the tipping allegations, he told a reporter, "I'm not interested in discussing this information with you." In its statement on Saturday, the MLBPA said, "As we have explained previously, in detail and in public, there was no improper tipping of players in 2004 about the timing of drug tests. As set forth in our letter to Chairman Waxman of the House Government Reform Committee, in September 2004 MLBPA attorneys met with certain players, but we are not able to confirm or deny the names of any of the players with whom we met." Anticipating that the 33-year-old Rodriguez, who has 553 career home runs, could become the game's alltime home run king, the Yankees signed him in November 2007 to a 10-year, incentive-laden deal that could be worth as much as $305 million. Rodriguez is reportedly guaranteed $275 million and could receive a $6 million bonus each time he ties one of the four players at the top of the list: Willie Mays (660), Babe Ruth (714), Hank Aaron (755) and Barry Bonds (762), and an additional $6 million for passing Bonds. In order to receive the incentive money, the contract reportedly requires Rodriguez to make extra promotional appearances and sign memorabilia for the Yankees as part of a marketing plan surrounding his pursuit of Bonds's record. Two sources familiar with Rodriguez's contract told SI that there is no language about steroids in the contract that would put Rodriguez at risk of losing money. Most ballplayers today are taking homeopathic growth hormone oral spray because it's safe, undetectable, and legal for over the counter sales. As time goes on it seems it might be considered as benign a performance enhancer as coffee, aspirin, red bull, chewing tobacco, and bubble gum.